What Did You Do Wednesday? Every grade level loves this game! Monkeying Around!! The portion of the tree that you hang the monkeys off is held up with a magnet. Students take turns spinning the attached spinner. 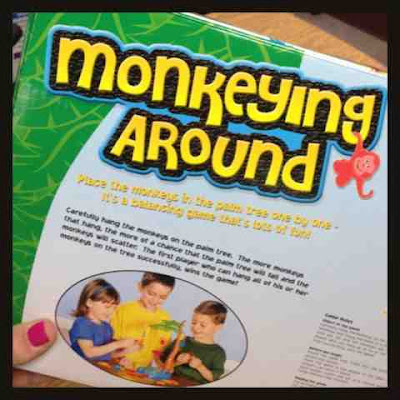 It tells you how many monkeys to put on the tree. Be careful where you hang them or the monkeys will fall into the alligator pond! It's like playing with barrel of monkeys, but in game form and so much more suspenseful! I do not get receive any compensation for these reviews, I just LOVE this game. Never seen that game either but I think my kiddos would love it! At my clinic we are finally able to go outside and the kids love sidewalk chalk. It can be used for so many things: describing, naming, articulation, giving or following directions. My practice doesn't end with the school year but we sure love getting outside in the summer. I've pulled my games like Operation and Elefun. We have also been doing outside activities...however today was a very cold/windy day here so we aren't going outside today! I love this game and so do my kids. I'm in private practice so I don't end with the school year but I always let the older kids pick their activities for the last couple of sessions before school ends for the summer. By then the kids are worn out and a little unfocused because they are so anxious to be done with school for two months. I love doing a fun summer craft. I love foam sheets cut into flower or sun shapes and decorating with glitter glue etc. Lots of opportunity to use all parts of speech. For the end of the year we are just having games and coloring. Gives me a chance to catch up on some work and listen to the student's carry-over skills. 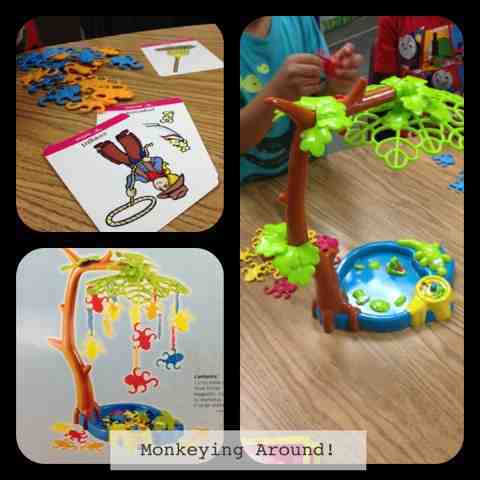 I have this game and my kids love it, they will all happily do their speech or language targets to get to hang a monkey on the tree! We don't finish the school year till 19th July in England so a way to go yet! YOU WON! Number 8 was randomly chosen! What a fun looking game! Going to have to get this one. We just found out today that we have an extra day of school to make up because of a bus driver strike! So, one extra day to plan for now! I love to take students outside to work- they love it! I love to do activities that are based around summertime activities. We have been playing with beachballs and ocean/ water themed games. Favorite end of the year activities.... I attend all the end of the year parties in the classrooms. I make my rounds and get great classroom samples of peer language interaction. But first my student must invite me. They have to approach their classroom teacher and ask if they can invite me. Next they have to make/write/draw/email/ichat an invitation to invite me. When I get the invitation I respond with an RSVP asking what I can bring to the celebration. So this requires another interaction with their teacher. Then when I arrive at the designated time, my students must introduce me as their guest to the class- even if the class knows who I am. I have a great time and get lots of end of the year data! One of my FAVORITES!! Makes boring skills fun!